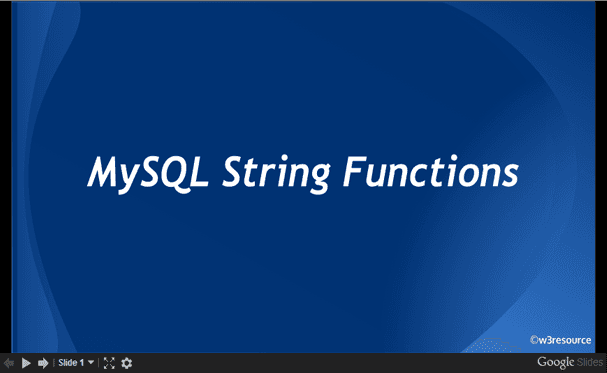 MySQL TRIM() function returns a string after removing all prefixes or suffixes from the given string. BOTH Indicates that prefixes from both left and right are to be removed. LEADING Indicates that only leading prefixes are to be removed. TRAILING Indicates that only trailing prefixes is to be removed. remstr The string to be removed. str The actual string from where remstr is to be removed. The following MySQL statement returns the string after removing the leading and trailing spaces from the given string ' trim '. The following MySQL statement returns the string after removing the leading string 'leading' from the given string 'leadingtext'. The following MySQL statement returns the string after removing the trailing string 'trailing' from the given string 'texttrailing'. The following MySQL statement returns the string after removing the leading and trailing string 'leadtrail' from the given string 'leadtrailtextleadtrail'.